When I was a boy my family lived in a leafy neighborhood in northwest Washington, D.C., known as Cleveland Park. Originally settled as agricultural country estates in the late 1700s, it was developed at the turn of the last century as one of Washington's first streetcar suburbs. That was when it was named after Grover Cleveland (1837-1908), the nation's 22nd and 24th President, who owned a house in the area in the 1880s that he used as his summer White House during his first term as President. Grover Cleveland sold the house, known as "Oakview" or "Red Top", when he lost his bid for re-election in 1889. It was torn down many years ago. Image courtesy of the Historical Society of Washington, D.C. Remarkably, the first house that was built in the area, "Rosedale," survives. It was constructed in 1793 by General Uriah Forrest (1746-1805), a Maryland statesman and military hero, who was an aide-de-camp to George Washington during the Revolutionary War. It is one of the earliest surviving houses in the city. 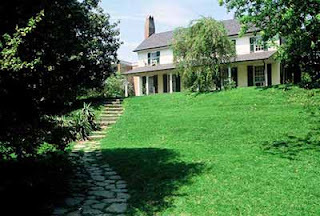 Today "Rosedale" is owned by the non-profit Rosedale Conservancy, which rescued the house and its grounds in 2002. The conservancy, which was formed by residents of Cleveland Park to save the property from development, has restored "Rosedale" to its original appearance, and its grounds are open to the public. Another early survivor is "Woodley", built in 1801 by Philip Barton Key (1757-1815), a wealthy Maryland landowner and member of Congress, and an uncle of Francis Scott Key (1779-1843), the composer of "The Star-Spangled Banner". Technically the house is not in Cleveland Park, but sits immediately adjacent to one of its borders. I am including it here, though, because its grounds once extended well into the area occupied by what is now defined as the neighborhood. Grover Cleveland leased "Woodley" as his second summer White House during his second term as President in the 1890s. Grover Cleveland was not the only President to occupy "Woodley." 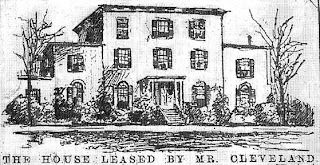 Martin Van Buren (1782-1862) leased the house in the 1830s during his earlier presidency. 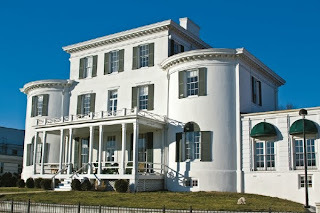 Another famous resident was General George S. Patton (1885-1945), who rented it in the 1920s. 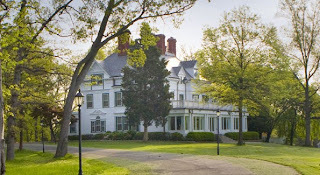 "Woodley" remained in private hands until 1950, when it was sold to the Maret School, which owns it today. 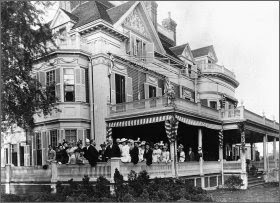 When Grover Cleveland bought "Oakview" in the 1880s it attracted a number of other wealthy Washingtonians to the area seeking to escape the city's oppressive summers, and they built large country houses there. 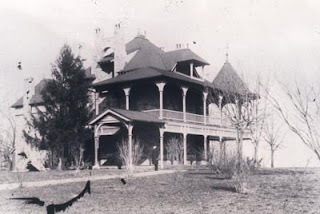 One of the houses that remains is "Twin Oaks", built in 1886 by Gardiner Greene Hubbard (1822-1897), a financier and philanthropist, and one of the founders of the National Geographic Society. "Twin Oaks" has been occupied by the Republic of China (Taiwan) since 1937 and served as that country's Ambassadorial residence until 1978. It is thought to be the largest privately owned property in the city. By the end of the 19th century a minor building boom in the newly-named Cleveland Park was underway, which really took off in 1891 when streetcar service from downtown Washington was extended to the area. 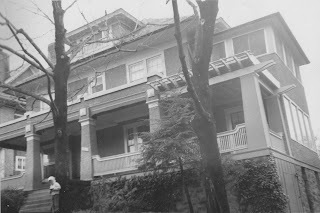 Development was largely completed within the next several decades, and most of the houses in Cleveland Park today date from between 1890 and 1930, a golden age of American homebuilding. My family moved to Washington, D.C., in 1960, when my father was appointed to a position in the Kennedy administration. 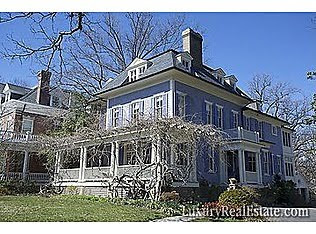 My parents bought a rambling, six-bedroom house in Cleveland Park on the corner of Macomb Street and 35th Street. I think they paid $40,000 for it. Built in 1917 in a hybrid Craftsman/Colonial Revival style, it was a comfortable, rangey house with a spacious front porch and pergola, and sleeping porches on the side and on the rear. It also had a large side yard, a rarity in the neighborhood, and occupied two city lots. We divided our time between this house and a forty-acre farm in Maryland that we went to on most weekends. Cleveland Park was, and remains, an affluent neighborhood. When my family lived there the husbands of the households were drawn from the professional classes and were employed as lawyers, diplomats, think-tank do-gooders, high-ranking government officials, newspaper editors, and the like. Almost all of the wives were stay-at-home mothers. Most of the houses in our part of Cleveland Park, one of the earlier sections developed, had wrap-around porches that people largely lived on during the warm-weather months, in the days before central air conditioning. 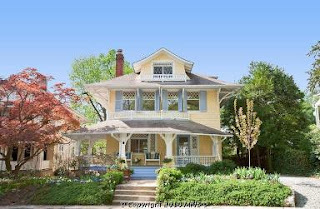 When strolling through Cleveland Park on a hot summer's evening back then, one would see families out on their porches, which were fully furnished with sets of wicker furniture, porch swings, and lamps. It was a friendly and sociable neighborhood where people knew their neighbors, and where the doors were rarely locked. But the doors needn't be locked, since there was usually someone inside the houses both day and night, whether it be the families who lived in them or the domestics who worked there. For these houses were built with the expectation that the lady of the house would not be the one who did the cleaning, laundering, or cooking--at least most of the time. In Cleveland Park in the 1960s, many of the houses still had live-in help of some kind--ours included--and almost everyone employed a maid, a gardener, or other support staff to help run and maintain the houses and properties. And there was a large population of people in the city engaged in such professions, mostly drawn from the African-American communities on the other side of town. The company of maids and other staff who worked for my family was a vivid part of my day-to-day life as a boy, as it was for almost all of the other children I knew in the neighborhood. I, like many of my friends, spent more time in the company of the Annas, Ninahs, and Henrys who worked for my family than I did with my own mother, who was often away from the house engaged in charitable and social activities. And I have no complaints about this arrangement, for it was a nice life. I have fond memories of the friendships I developed with the people who worked for us then. As you can see, the house really looks nothing like it did when my family lived in it. One positive thing that later owners did was to add a swimming pool in the side yard. I suspect that I would have enjoyed having a pool on our property as a boy, rather than having to walk to the nearby Cleveland Park Club where we went to swim during warm weather. But now that I think of it I'm glad we didn't have a pool then. Because if we did our side yard would not have been the gathering place for neighboring children to play in as it was when we lived there, nor would I have had the pleasure of afternoons spent swimming at the Cleveland Park Club, where there were other children to meet and play with. Today when driving through Cleveland Park one is met with a very different scene from what one would have come across when I was a boy. For one thing, there aren't as many people out and about during the day. Fewer families have stay-at-home mothers, and the population of domestics and gardners that once supported these houses has largely been replaced with cleaning and lawn services, or done away with altogether. The difference that the intervening forty years has made is even more vivdly seen at night during the summer. As I wrote earlier, when I was a boy and when the weather was hot, the porches of Cleveland Park were full during the evening of families out enjoying the cool(er) air. Today when one passes through the neighborhood during a summer's evening there is not a single person to be seen on its empty porches. That's because everyone is locked behind hermetically-sealed doors in air-conditioned isolation, watching television, obsessing on their BlackBerries, or staring at a computer screen. I blame central air conditioning more for this development than I do the explosion of electronic media, but it's guilty, too. 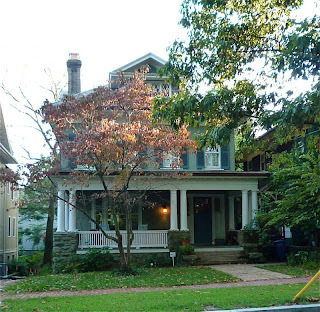 Although Cleveland Park remains a lovely, leafy neighborhood today full of wonderful houses, I doubt there's as much a sense of neighborhood there now as there was when I was a boy. Although my childhood neighborhood was in KC rather than DC, the atmosphere was the same -- the front porches, the people out and about in the neighborhood -- neighborhoods are wonderful and yes, I agree that AC has certainly changed our lives! Those warm summer evenings were magical... ..the murmur of the grownups visiting on the porches while we ran around catching fireflies. Martha I am hailing from Kansas City as well. The other thig is garage door openers that take people right into their homes, never to be seen outside again!! 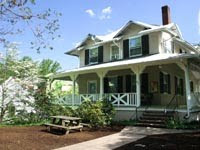 We do have gorgeous historic properties here. Reggie, a very good post. I do miss the buzz and activity of a good porch. You might want to waste a moment on Google Earth looking at what Jacobsen has done to Herman Wouk's old house on the northwest corner of N and Prospect. "Scandalous" is just the beginning. P.S. You left out something important: There are no sidewalks in Cleveland Park, and nowadays, the narrow streets are lined with cars. DED: I'll be sure to check out the Wouk house, as you suggest. There are sidewalks of laid red brick in most parts of CP, as you will see in some of the photographs I posted. Maddening to shovel of snow (I speak from experience) and a brute to maintain, they are a lovely addition to the street-scape. The residents of the area are quite proud of them, and have aggressively resisted all efforts by the city to replace them with easier-to-maintain concrete ones. You are correct in that certain areas in the neighborhood, such as Highland Place, do lack them. One of my favorite neighborhoods, where we do a lot of our work. Jacobson's early work, he readily admits, wasn't very good. Much of it was in Cleveland park and I know of several examples in particular that he won't even claim. Luckily, much of that late 20th century work is being undone. What you won't be able to see, however, is the interior of the house, which was entirely gutted and "modernized" in the worst possible way. It defies belief that this passed muster with the relevant preservation bodies. Reggie - Ah, the glory of our side yard at Macomb and 35th. I vividly recall the crude zip-line that ran its length. That was a neighborhood child magnet like no other. As I recall, it was installed by a fellow whose 16-year-old daughter later nailed me on her first day as a licensed driver while I was cycling across 34th Street (at Newark) on my way to see my friend Frank. His family lived on sidewalk-free Highland Place near the Cleveland Park Club back then. I spent a week sweltering in traction at Childrens Hospital, which had yet to adopt the AC that is now taken for granted. Such fond memories! Mr Darling, you're right about the butchery and it's interesting to read the comment from ArchitectDesign about Jacobson admitting some of his early work was not very good and that there are some examples he won't even own. Still, he gained his celebrity thereby, so what does it matter to Jacobson? In the 1960s there was a vogue amongst architects straight from school to strip classical interiors of moldings, columns and cornices and much damage was done in the name of modernity. Good post and documenting your home and neighborhood. This is not far from where I live and I found this to be a wonderful history lesson as well as a good story. I have the best memories of playing cards...mostly hearts and spades in the 70's on our front porch late into the evenings of hot, humid summer nights with other neighborhood kids as well as plenty of "Ghost in the Graveyard" on cooler nights when we we were all restless. The demise and alteration of beautiful architecture is always so sad to me. But, at least your memories are of original beauty and wonderful people! Reggie, that was so fascinating! I was oohhing and aahhing over so many of the houses, especially yours and the one two pictures down from it! My grandfather worked for Kennedy as well, more in Boston though, Francis Dowling. I wonder if our family has crossed path with yours? That stuff always gives me chills! H.N. Jacobsen, then or now, is not a good choice for the architect of a renovation, especially in a historic neighborhood of significant consistency! Interesting piece. I grew in in Cleveland Park in the 60s as well, though clearly you were in the more "fashionable" section. I'm guessing you were on the other side of Conn. Ave. My street (Macomb) was filled with artists and interesting people, but they were not wealthy. I very much doubt they were members of the Cleveland Park Club. I know we weren't. Sounds nice! We did have a nanny, but only because my mother, a single mom, worked. From the sound of it, you may not have gone to Eaton, the neighborhood school. No loss because frankly, it sucked--but that's another story. I loved the hood, and the unparalleled freedom we had as kids before parents hovered relentlessly over their children. 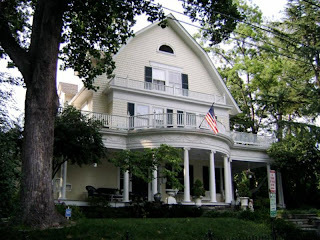 Yesterday, a friend and I took the Cleveland Park walking tour published in "Washington on Foot." It was a beautiful day and we were astonished at the beauty of both homes and gardens. The air smelled of an amazing bouquet of lilacs and the blue sky brought the perfect contrast to the white friezes, the many turrets and porte cocheres. Thank you for your blog.